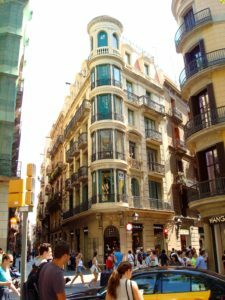 Barcelona is the largest city in the Catalonia region of Spain. 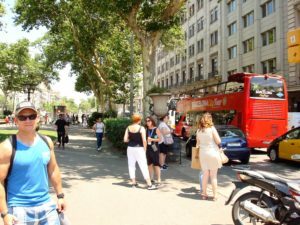 With a population of 1.6 million people within its city limits, this is easily the largest metropolis on the Mediterranean Sea. 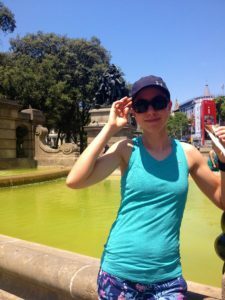 When Rebecca and I arrived in late June, the weather was extremely warm and pleasant. 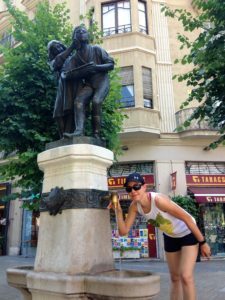 Donned in comfortable sneakers, tanktops, and sneakers, we put down some serious miles during our two-day walking tour of these historic streets. The Columbus monument, built in 1888 for the World Exposition, honors Christopher Columbus’ first voyage to the Americas. 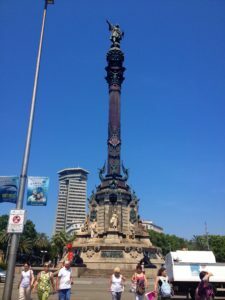 This monument was the first landmark we encountered as we left the Barcelona Port and entered into the city. 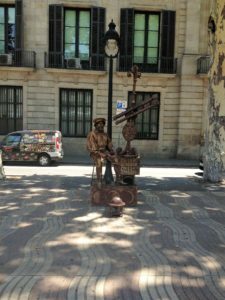 This iconic symbol commemmorates the historical voyages of Christopher Columbus who reported his findings to Queen Isabella I and King Ferdinand V in Barcelona, Spain after his first trip to the newly discovered continent. Big John demonstrates how real men aren’t afraid to wear plaid shorts. 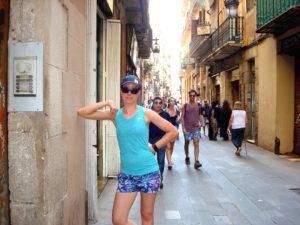 My beautiful travel companion props up an elbow on the Barcelona streets. 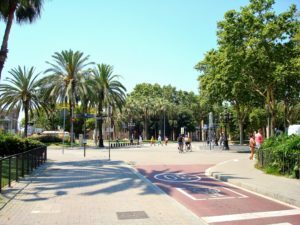 These magnificent palm trees are a common form of vegetation along Barcelona’s parks and streets. 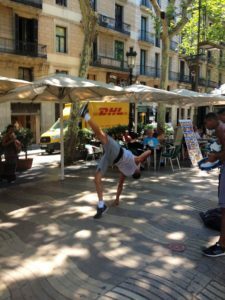 Big John on Barcelona’s famous La Rambla Street. 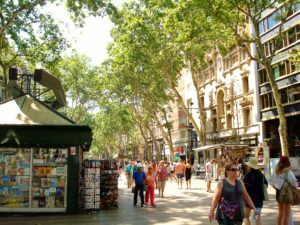 La Rambla, is a street in central Barcelona that is popular with tourists and locals alike. 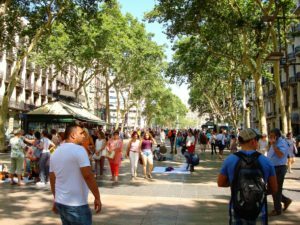 This tree-lined pedestrian mall stretches for 1.2 kilometers connecting Plaça de Catalunya in the center with the Christopher Columbus Monument at Port Vell. 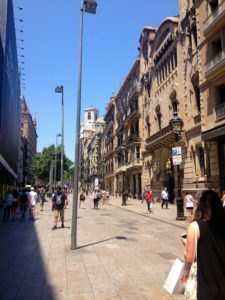 La Rambla is the mecca for Barcelona tourism. This famous walking trail is a gold-mine for souvenir seekers. Just about everything can be purchased here, from salt-water taffy to knock-off designer purses. 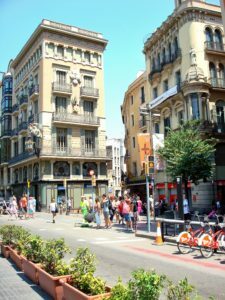 A Chinese dragon can be seen protruding from the corner of the building, offering testament to Barcelona’s cultural diversity. It seems when laundering, open-air drying is the norm in most Mediterranean cities. 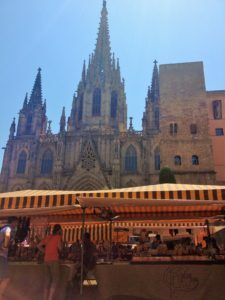 Street vendors peddle their wares under the backdrop of the Barcelona Cathedral. 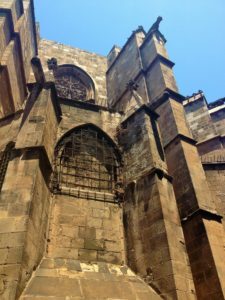 The Barcelonal Cathedral, or the Cathedral of the Holy Cross and Saint Eulalia, is a Gothic architectual wonder. 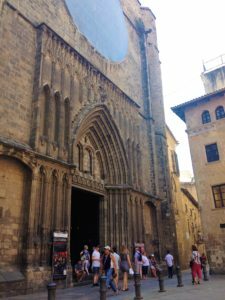 Dating back to the 13th century, this ornate cathedral is open to tourists and contains a gift shop within. The roof is most notable for its gargoyles and features a wide range of animals, both domestic and mythical. 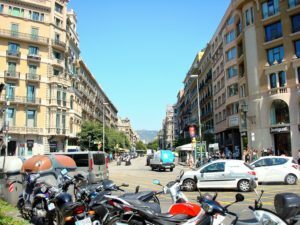 Scooters and motorbikes seem to be one of the more popular modes of transportation in Barcelona. 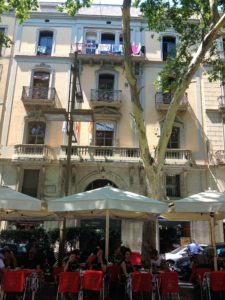 If one doesn’t mind the crowds, the areas in and around La Rambla is a shopper’s paradise. 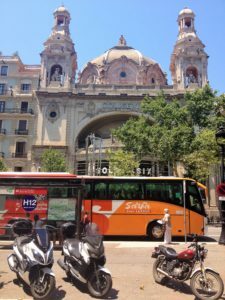 If you would rather ride than walk, the Barcelona City Tour offers a way to see the city from the comfort of a double-decker bus. 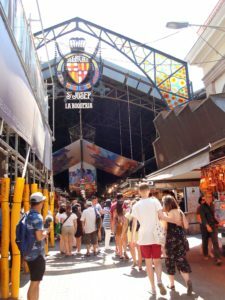 The Mercat de Sant Josep de la Boqueria, often simply referred to as La Boqueria, is a large public market in the Ciudad Vieja district of Barcelona and one of the city’s leading tourist attractions. 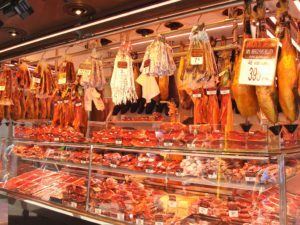 Spanish ham from Jabugo is diplayed in many of the markets and restaurants throughout the city. Imagery such as this is what diabetic dreams are made of! 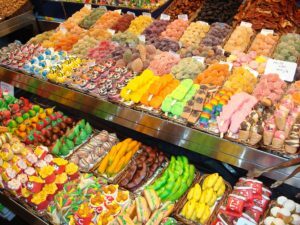 If you came to Barcelona for the candy and nuts, you came to the right place! 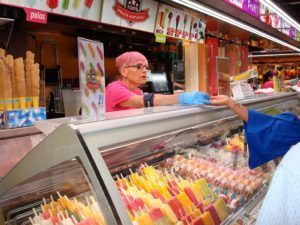 Every good popsicle salesperson knows you can’t truly be successful unless your hair color matches the flavor of the week. 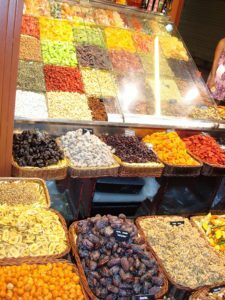 Dates, figs, apricots, and other dried fruits can be found in abundant supply inside La Boqueria. This colorful fruit stand featured some of the largest cherries I had ever seen. 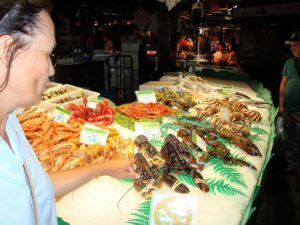 Kindly remove your pinky finger off of the crustacean, ma’am! 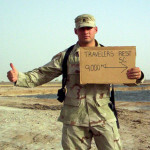 Can’t you read the sign? 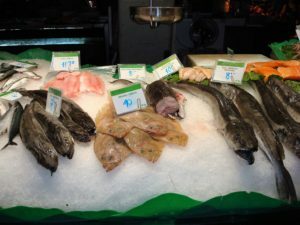 … and this was the precise moment I swore off fish forever. According to some research, benefits of the medjool dates include improved digestion, nutrient uptake, vision health, osteoporosis, hormone issues, low metabolism, constipation & wound healing. If any of that bears truth, these sweet and chewy treats should practically sell themselves. 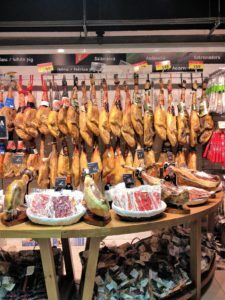 When you’ve seen one Spanish ham hock, you’ve undoubtedly seen them all. 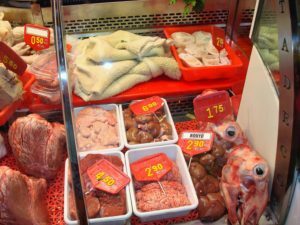 The market offers a variety of food choices to appeal to its diverse clientele, for instance, this particular section is very popular amongst zombies and serial killers. Deciding to forego the sheep brains and big-eyed goat heads, I figured the citrus would prove a much safer bet. I thought the sight of these palm trees against the Spanish architecture was worthy of a picture. Looks like this guy is off to the metal scrap yard with his cart full of treasures. Barcelona’s Port Vell aerial tramway first opened in 1931. This high-altitude tourist attraction offers excellent views of the city and its port. 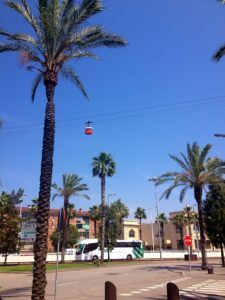 The tramway starts at Miramar Station, at an altitude of 187 feet , and carries passengers to the top of Torre Sant Sebastià (a 78-meter tall free standing lattice tower)at 282 feet. I’m not certain of this building’s significance, but I felt that the intricate details of its rooftop were definitely worth admiring. 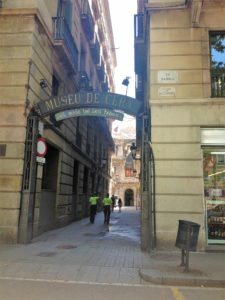 Two Barcelona officers on a stroll towards the entrance of the Museu de Cera. 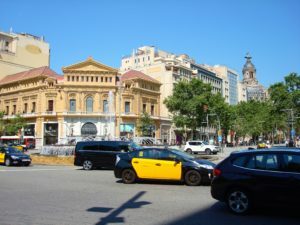 The Museu de Cera is a popular museum featuring waxwork figures of historical and cultural significance. These wax figures near the museum’s entrance aren’t wax at all. 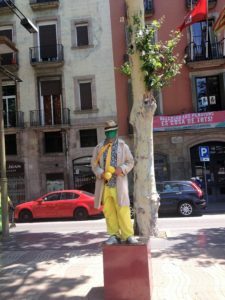 When paid to do absolutely nothing but stand around, these statuesque street performers stay committed to the task! I would hate to see Galileo’s bathwater following a hard day at work! …so this is what became of Jim Carrey’s acting career. 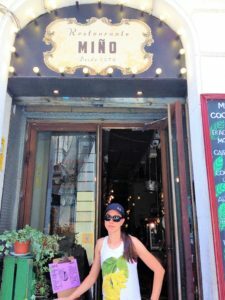 Open-air dining along the La Rambla pedestrian trail. 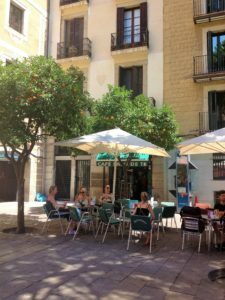 The Osterhase street cafe seats its patrons under the shade of orange trees and umbrellas. 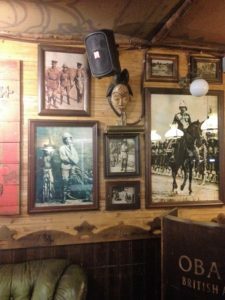 Original or crispy, there’s nothing more “Kentucky” than eating Kentucky Fried Chicken in the heart of Catalonia! 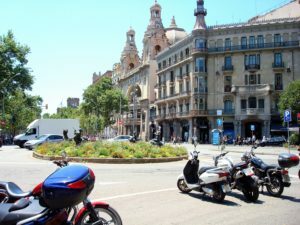 Barcelona received an estimated 32 million tourists in 2017. Visitors congregate in front of the Santa Maria del Pi’s grand entrance. 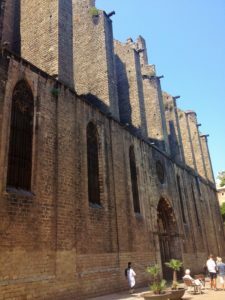 The Santa Maria del Pi is another spectactular 14th-century Gothic church in Barcelona. 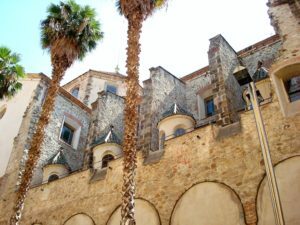 It is situated on the Plaça del Pi, in the Barri Gòtic district of the city. During our wanderings, we stumbled upon the 2 Bis Artesania. 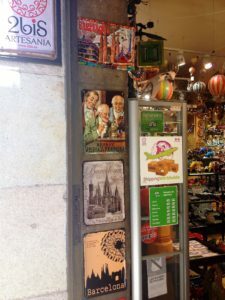 Located in the city center, this shop boasts being one of the most important craft workshops in town, and the go-to place for anybody looking for unique gifts. 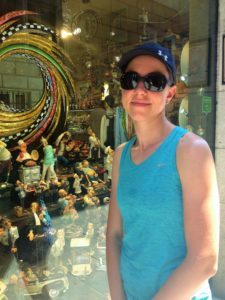 Rebecca stands outside a shop window full of an assortment of whimsical figurines. 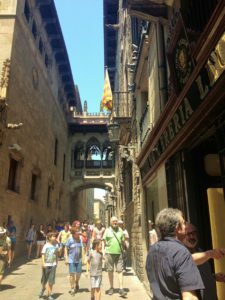 Barcelona’s Roman past can still be felt when touring her ancient streets. 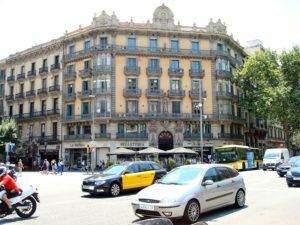 Barcelona has a fascinating history. The city was founded by Phoenicians and Carthaginians. 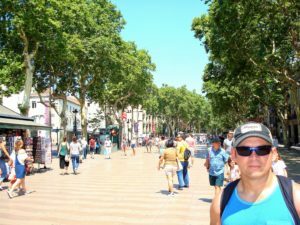 The original name of the city was Barcino, likely named after the Carthaginian ruler, Hamilcar Barca, in the 2nd century, BC. The settlement eventually grew to become the largest known Roman village outside of Rome itself. 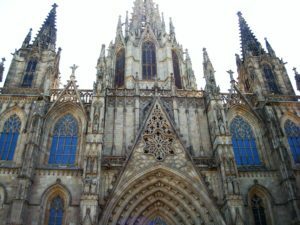 As evident in many of these pictures, both the Gothic period and the time of Modernism have left their traces that still remain intact today. 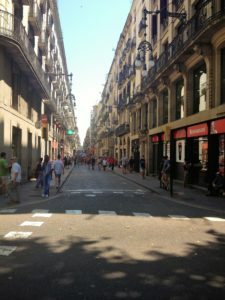 Much of Barcelona is very pedestrian-friendly and reserved for foot traffic only. 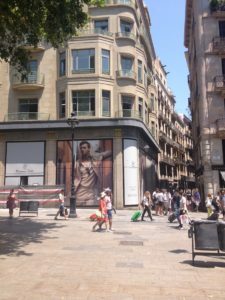 Barcelona is home to Massimo Dutti and other high-end retail stores. 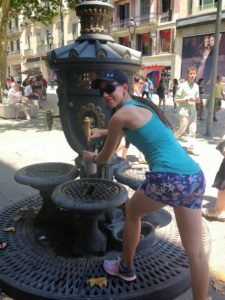 Numerous drinking fountains are situated throughout the city for its thirsty wanderers; they are know to attract extremely attractive women such as the one pictured here. When I saw the sign outside the establishment, I really had no idea what to expect inside. Was the eatery named after our 45th president our was our 45th president named after the place. 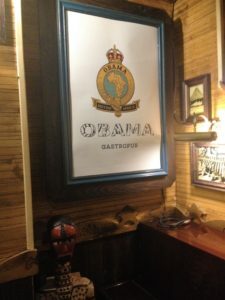 As it turned out, the Obama Gastropub is a charming American English centuries-old pub in colonial style decor. 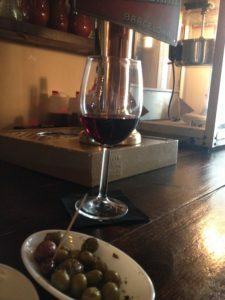 The staff was very friendly and helpful, serving up delicious food ranging from homemade burgers to authentic Spanish tapas. As Rebecca and I had worked up quite the thirst, we were well pleased by Obama’s wide range of imported beers. 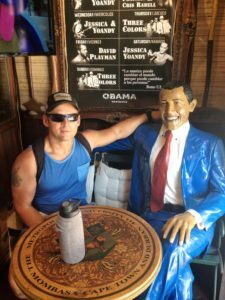 Although I didn’t vote for the guy, Obama was gracious enough to invite me in for a beer summit. Two members of Obama’s welcoming staff. 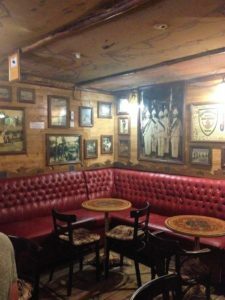 Although our Obama was an American president, this joint offered more of a British flare. 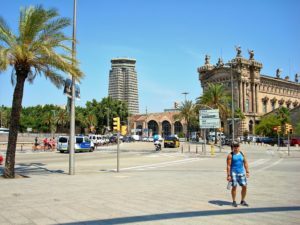 A tour bus picks up an awaiting passenger outside the Barcelona Coliseum. Although this coliseum appears ancient, it was actually constructed in 1923. The building remains one of the biggest film theatres in the city as well as an iconic example of 1920s monumental architecture. Rebecca eats a protein bar while naked Romans enjoy a cluster of grapes in the pool behind her. Beer’linale opens its doors in 2016. 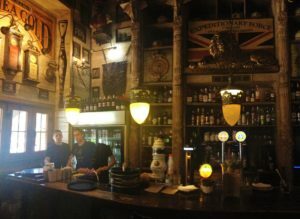 The establishment prides themselves as offering the best craft beers on the market to pair perfectly with excellent Mediterranean cuisine. 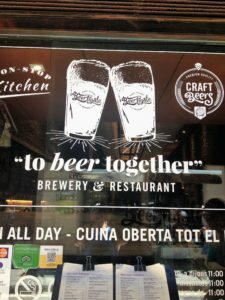 This taproom features over 180 craft beers, 30 on tap, and over 80 Spanish tapas and dishes. 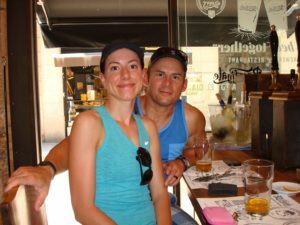 Yeah, with delicious foods and excellent craft beer, you can see we’re all smiles! I believe this young lady at the bar might just be flirting with me! 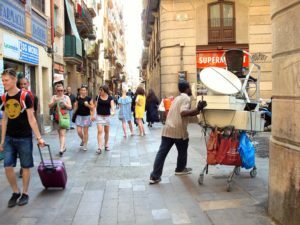 A busy day to be out and about in the streets of Barcelona. Don’t look behind you, just walk towards the sound of my voice! One funny quirk about Rebecca is she’s deathly afraid of birds. 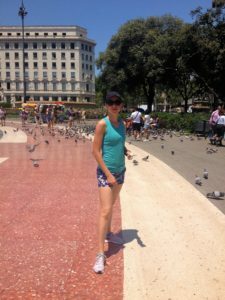 With the horde of threatening pigeons approaching fast, I need to find this girl her safe space. 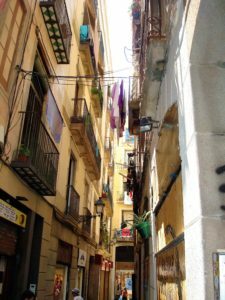 The bit of topography observed at the end of this street offers evidence of Barcelona’s hilly terrain. 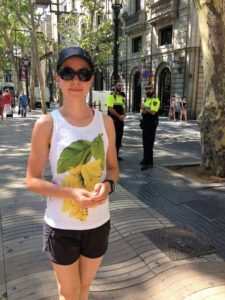 It appears that the Barcelona police are somehow on to me! 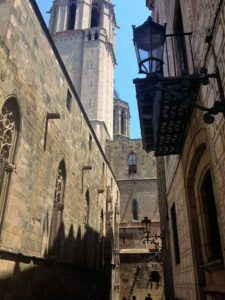 From Comedy Clubs to Cathedrals, Barcelona seems to have a little bit of everything. 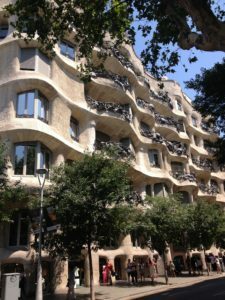 This building is one of the many unmistaken works of Antoni Gaudi. 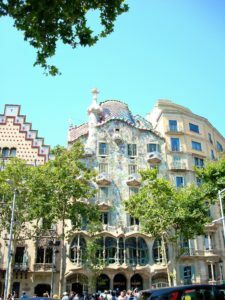 Antoni Gaudi (1852-1926) was an architect from Reus, Catalonia, Spain. 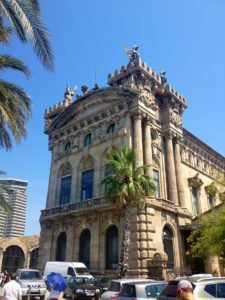 He is the best known as a practitioner of Catalan Modernism. Gaudí’s works have a highly individualized and distinctive style that is easily recognizable. 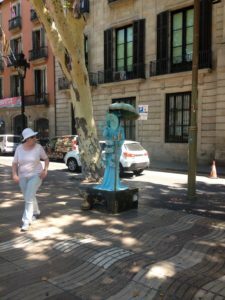 Most of Gaudi’s creations can be found in the streets of Barcelona. 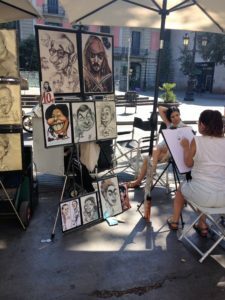 A talented caricature artist sketches a portrait of her posed subject. Sorry officer, she’s already found her a lawman! 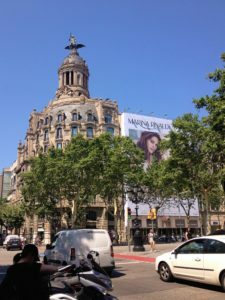 An example of ancient and beautiful architecture can be seen on the dome of this winged statue, overlooking the famous Passeig de Gracia Street. Those grimy kids are bathing in that water! Are you sure you want to drink it? 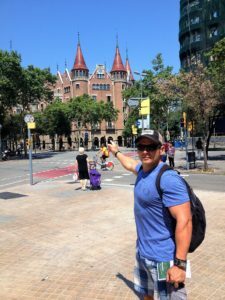 That looks just like my castle at home… only it’s a lot bigger. Alright, you got me! I live in a van down by the river. 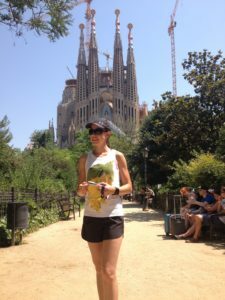 Rebecca stands in front of Antoni Gaudi’s most famous creation, the Sagrada Família. The Basílica de la Sagrada Família is the largest unfinished Roman Catholic church in the world. 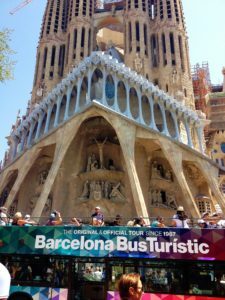 On March 19, 1882, Antoni Gaudí began work on this highly distinctive place of worship. The celebrated architect worked tirelessly on the temple for 43 years until construction was halted by his untimely death on June 10, 1926. 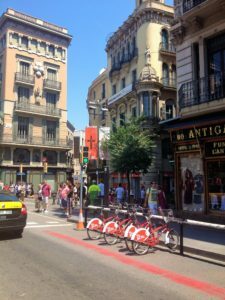 It was three days earlier, on June 7, when Gaudí was tragically struck by a passing tram while crossing the street. Due to his poor dress and haggard appearance, bystanders mistook him for a vagrant and didn’t offer him the immediate medical assistance that might have saved his life. Gaudí is buried in the chapel of Our Lady of Mount Carmel in the crypt of the Sagrada Familia. 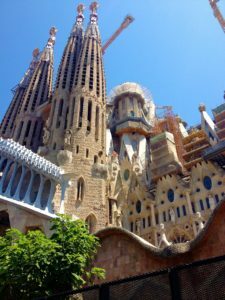 Work remains on Gaudí ‘s basilica to this day and is in its final stage of construction. 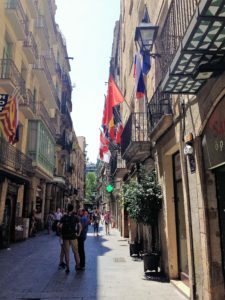 The flags of many nations are represented on this narrow Barcelona street. 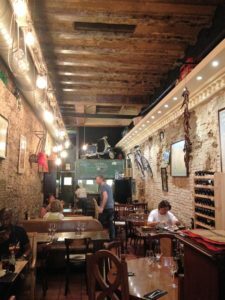 The Restaurante Miño is well known in Barcelona for freshly served fish and Spanish tapas. 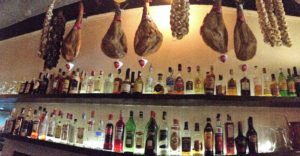 This place evidently serves hanging ham hocks and hard drinks! 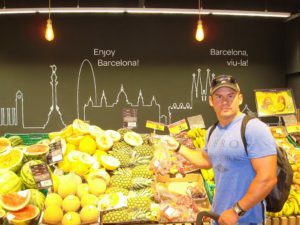 When touring Barcelona, we found that the best way to enjoy the city was through our palates. 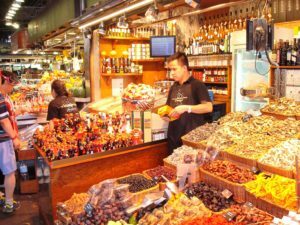 Visitors to this Catalonian capital will find an amazing food culture ranging from reasonably priced daily menus to internationally renowned Michelin-starred eateries. 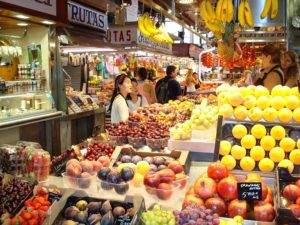 Whether one is exploring the city’s historical center, or perched high on a terrace with views of the Mediterranean, the tastes of Barcelona are certain to please! 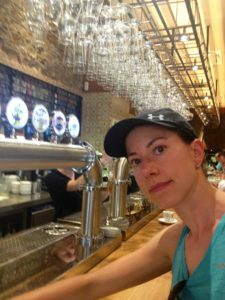 While I enjoyed craft beers, Rebecca was more inclined to sip a glass of Spanish red wine. 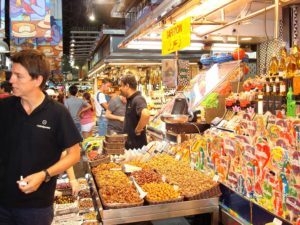 Barcelona is truly an international city with something to satisfy the taste of every visitor. 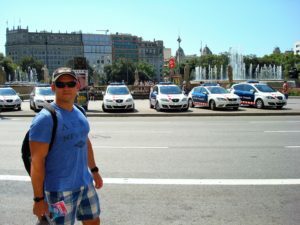 I hope you enjoyed our photo-journey through the streets of Barcelona and I pray that you’ll visit my site again soon. 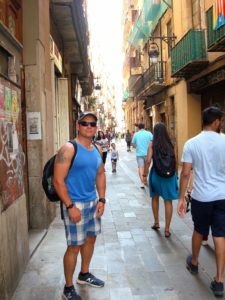 Please send a comment my way so I know you were here or share some love on social media – Muchas gracias, amigos! Thanks for your beautiful comments. I’m so happy you enjoy my site. 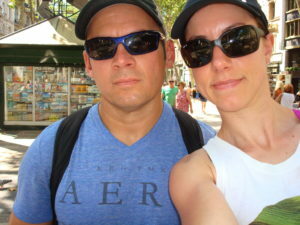 Thanks for sharing your special memories John and Rebecca. John, as always you made me laugh, smile, and yearn for this special place; Rebecca, as always you beautifully adorned the setting and provided ample inspiration for John. I hope you two love birds had a wonderful time; our hope is to join you on one of these adventures some day. Love your sis Shannah, Brian, and family.